As Britain’s oldest brewer, Shepherd Neame has a few tricks up its sleeve, and this organic ale is one of them. Light and refreshing, it’s made from chalk-filtered mineral water, the finest organic hops and winter pearl malting barley. Named after the Kent coastal town famed for its oysters, Whitstable Bay ale goes particularly well with seafood. 8 Whitstable bay ale 50cl: Alcohol 4.5%, Allergens: barley, Suitable for vegans. At Shepherd Neame brewing is both an ancient and a modern art. A family-run business since 1698, Shepherd Neame employs sustainable 21st century techniques to produce its award winning distinctive beers, which also include Spitfire, Bishop's Finger and Asahi. 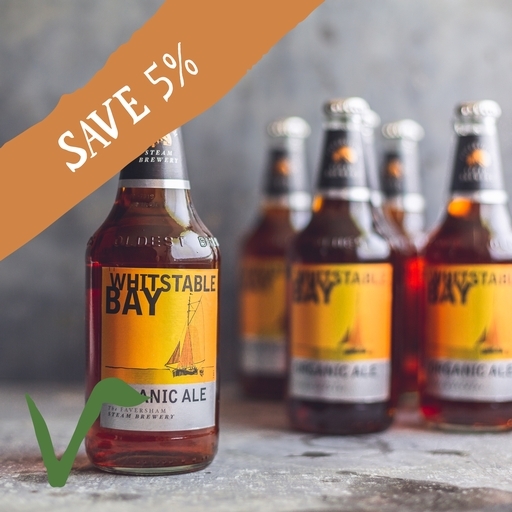 The bittersweet flavour of the Whitstable Bay Organic Ale comes from the particular blend of English malted barley and organic hops. The barley is germinated by the skilled maltster who then roasts it. How darkly the barley is roasted dictates how dark the final beer is.